Mauricio Pochettino believes most coaches in football dream of being "one per cent" as successful as his long-time sparring partner Pep Guardiola. The former Espanyol and Barcelona rivals meet in the second leg of Manchester City and Tottenham's Champions League quarter-final clash on Wednesday, with Spurs taking a slender 1-0 advantage to the Etihad Stadium. With City's bid for an unprecedented quadruple on the line and Tottenham looking to breach new ground in Europe's premier competition, the stakes are high, but Pochettino was keen to reflect beforehand on the journey both men have taken from entering elite coaching in Catalonia a decade ago to where they now sit at the summit of English football. Guardiola's off-the-cuff reference to Spurs as "the Harry Kane team" last season appeared to cause some bad blood on Pochettino's part, but the Argentine tactician was in relaxed mood in Manchester as he noted the common history enjoyed by staff on both benches. "It's not more motivation or a bigger challenge [because of Barcelona and Espanyol]," he told a pre-match news conference. "The challenge is that Guardiola is one of the best managers in the world. "Of course, I am an Espanyol fan, I am going to support Espanyol. I played more than 10 years and I coached Espanyol for nearly five years. "He was at Barcelona nearly all his career as a player and we started our coaching careers at the same time. "It makes it special, the situation, because we have a good feeling between us. It is a good feeling that he has in his coaching team. Mikel Arteta or [club doctor] Eduardo Mauri or [fitness coach] Lorenzo Buenaventura are all good friends. "All these people are all good friends. It is the challenge, it is the motivation, but at the same time it is nice to see them because we met in Barcelona playing a lot. "Now we are in England, in Manchester and London, playing in the quarter-final of the Champions League. For me it’s a massive dream – for them maybe not too much – but for me it is a massive thing." 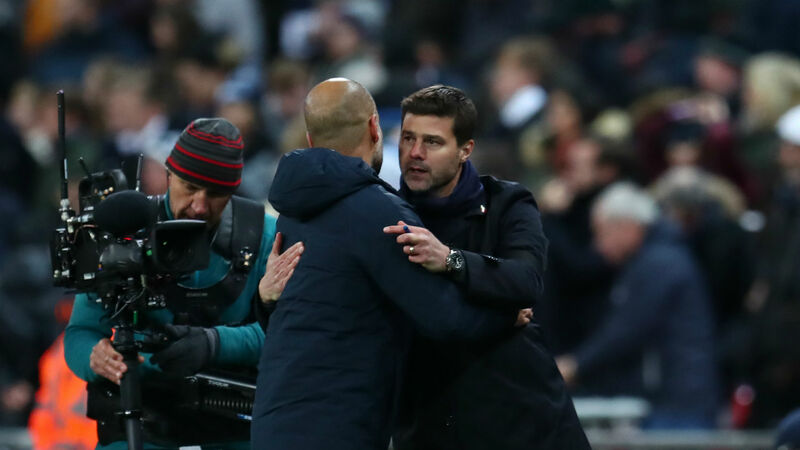 Pochettino went on to be effusive in his praise of Guardiola's prolific career at the top level, while noting they have largely operated in very different realities on their way to a finely poised clash. "I don't remember and sorry if I am wrong but I think he won 24 or 25 or 26 trophies in his career," he grinned. "I think he is the most successful manager in the last 10 years, for sure. There is not another like him, of course. "But for me, winning a title with Tottenham is a massive dream. To win 24 or 25 or 26 - I'm not sure - is more than a dream for any manager in the world. What he did in Barcelona, Bayern Munich and now with Manchester City is unbelievable. It shows his quality and how good he is." Pochettino added: "Of course, for us it is not easy. I think we measure our success, different coaches earning different things. "I think Espanyol, Southampton and Tottenham are different projects to Barcelona, Bayern Munich and Manchester City. We need to settle our objectives at a different level. "But, of course, any coach can dream to be maybe one per cent as successful as Guardiola is."